Click “Room Finder -> My Room Finder Units” and then configure them by pressing the cogwheel symbol. Follow the guide. Note that for all settings there is a question mark symbol with further information. Download Room Finder software either from Google Play or directly to your device. 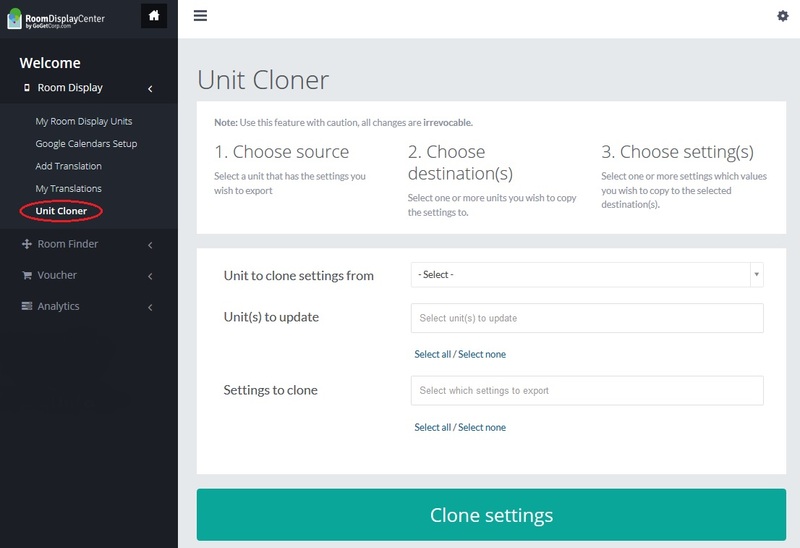 Settings will now be downloaded to the unit and you are all set up! Check that you are using the correct user name and password. Double check by logging in to https://www.roomdisplaycenter.com. Tap the logotype in the bottom right corner of the display to reach the settings menu. Meeting rooms needs to be added individually. Go to: Room Display->My Room Display Units and press the cogwheel symbol for the device you wish to add. Thereafter select the right Room Finder display under “Room Finder Settings”. Tap an arrow repeatedly until you reach the new desired direction arrow. Room Sync/Room Sync Plus have Room Display 5 software installed. To get started, you need to create a Room Display Center account for managing the devices and thereafter register your display unit(s). You will need one license key per device. I cannot find my license voucher/keys? Licenses are delivered in the form of electronic license vouchers containing any number of license keys. Contact your reseller for information on how to get your license voucher. It can take up to 1 minute for any changes in the calendar information to take effect, so be patient. Check that your internet connection is unrestricted and that the correct communication ports are open in the firewall. See: FAQ -> Room Display 4/5/6 -> Firewall ports. For example many company guest networks restricts communication ports that Room Display need to function properly. Download Room Display 5 or 6 software either from Google Play or directly to your device. Do I need to install server software? No, unlike alternatives on the market you do not need to install any server software or plug-ins. Instead, the Room Display systems utilize more modern authentication processes and can connect directly to Google Apps or Exchange/Office 365. 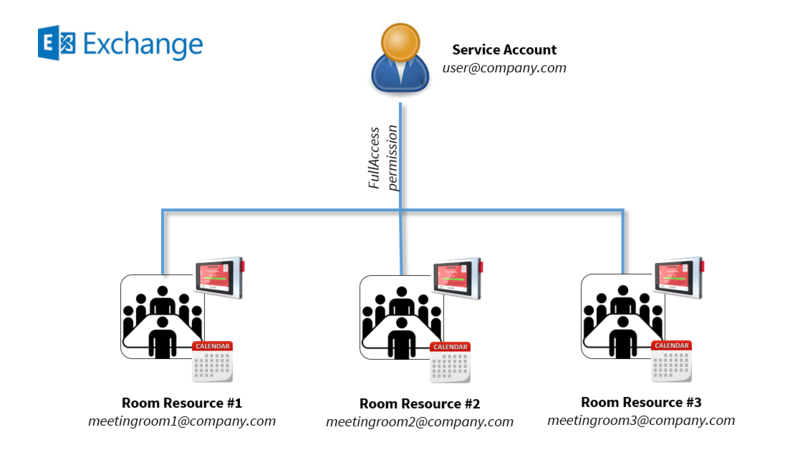 A complete step-by-step guide to integrate Room Display software with Exchange. 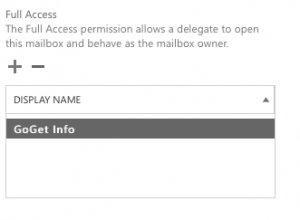 Service Account is an account in Exchange with its own mailbox and FullAccess permission to the Room Resources (ie the meeting rooms). It is used by Room Display to access booking information and can either be an existing user or a new account. Don’t know your EWS URL? UPN styled usernames are in this style: username@domain.com. If you use this style, then enter the full text in “Service Account Username” and leave the field “Service Account Domain” empty! Old-styled usernames start with the domain name and then the username after a slash (\). If you use this style, then enter only the Username in the field “Service Account Username” and move on to the “Service Account Domain” field and enter only your domain. Service Account Domain: Domain name should only be entered if you use the old-style NETBIOS username format which looks like this: DOMAIN\username. If so, then enter only the domain name here. If you use UPN username e.g. username@domain.com this field should be left empty! 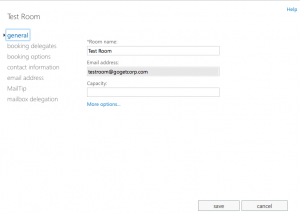 Resource Email / Room email: Resource email is the email address of a resource (ie the meeting room) in Exchange which your Service Account has FullAccess permission to. Normally a resource email have the format: room@company.com. Note that Room Display will not work unless the Service Account (the account under “Username”) has FullAccess permission to the resource! 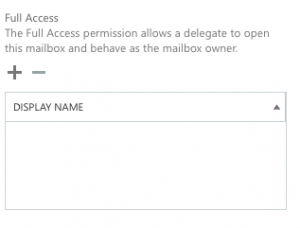 For information on how to set FullAccess permission see this FAQ -> Exchange/Office 365 -> Setting up Exchange for Room Display (Powershell).Troubleshooting tip: if you have connectivity issues try adding the Service Account email also as Resource Email / Room email. 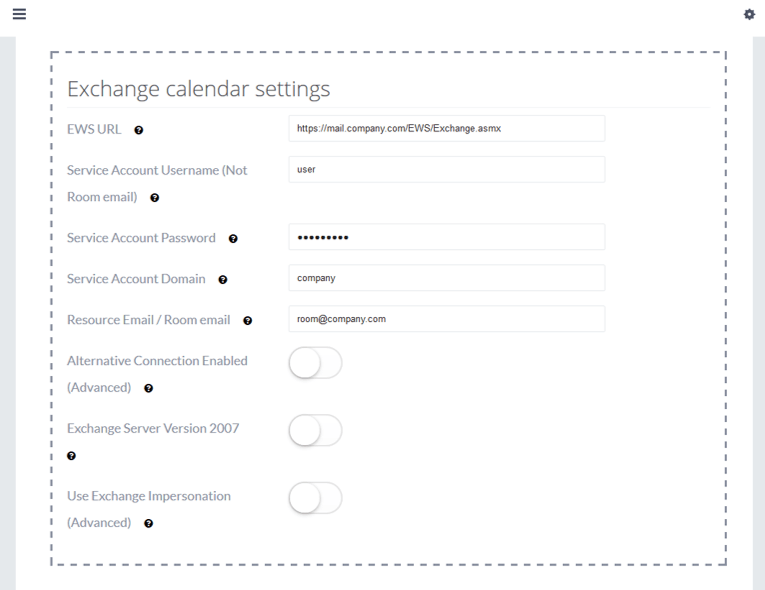 This will display the Service Accounts own calendar which it always have FullAccess permission to. Check if your Exchange server uses NETBIOS or UPN login style and double check that the information is entered correctl. 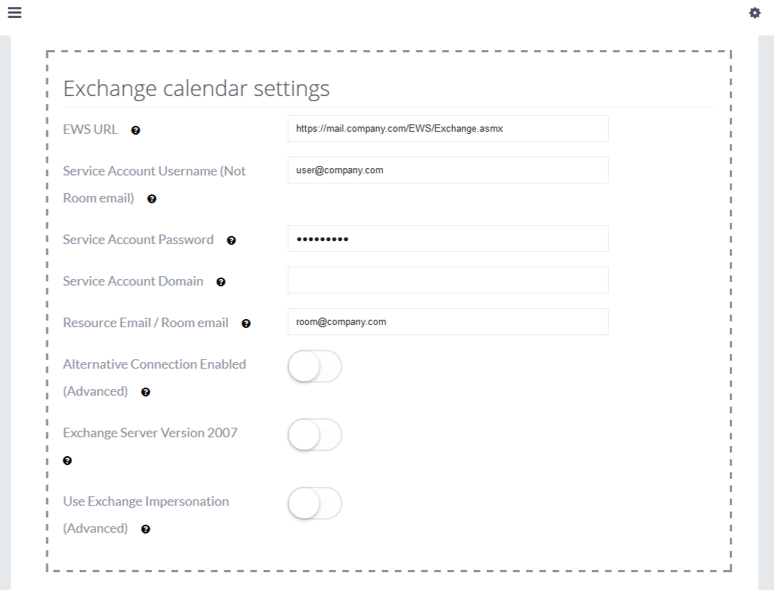 Resolve issues with the Exchange integration by following the steps below. Check that your device have a working network connection. Press: Menu Icon -> Settings Icon -> General Device -> Wi-Fi Settings in the application. If you are connected to a Wi-Fi network, disconnect and select the option “Forget Network”. Thereafter reconnect to the Wi-Fi network. The EWS URL is incorrect. See FAQ -> Exchange/Office 365 -> Determining the Exchange Web Services (EWS) URL on how to check it. Make sure that the service account username is correct. Make sure that the “Service Account Domain” field is empty. Domain name should only be entered if you use the old-style NETBIOS username format (DOMAIN\username). The service account password is wrong. The username syntax is wrong. Check if your organization is using UPN (e.g. username@domain.com) or NETBIOS Style (e.g. DOMAIN\Username). The room resource does not exist or is typed wrong. Most likely the service account does not have FullAccess permission to the room resource. 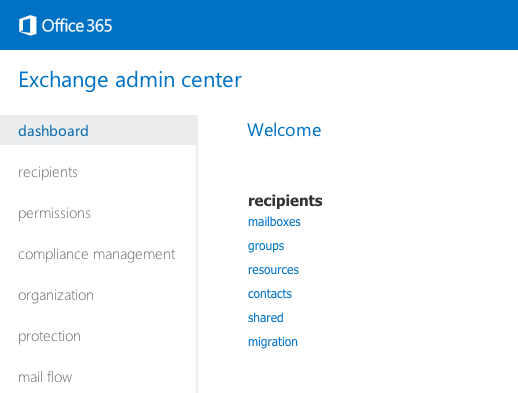 See FAQ -> Exchange/Office 365 -> Exchange room display powershell or ask your Exchange Admin to set the correct permission. Note! It may take up to one hour before permission changes take effect, so be patient. Most likely the room resource in Exchange is corrupt. Delete and then recreate the room resource in your Exchange server to resolve this issue. If you are still unable to resolve the issue follow the guide below to check with Microsoft’s servers. Click “Service Account Access (Developers)” then “Next”. Fill in your Exchange information. 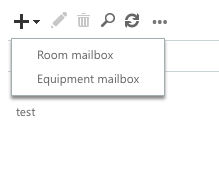 Add the name of the room resource under “Target mailbox email address”. 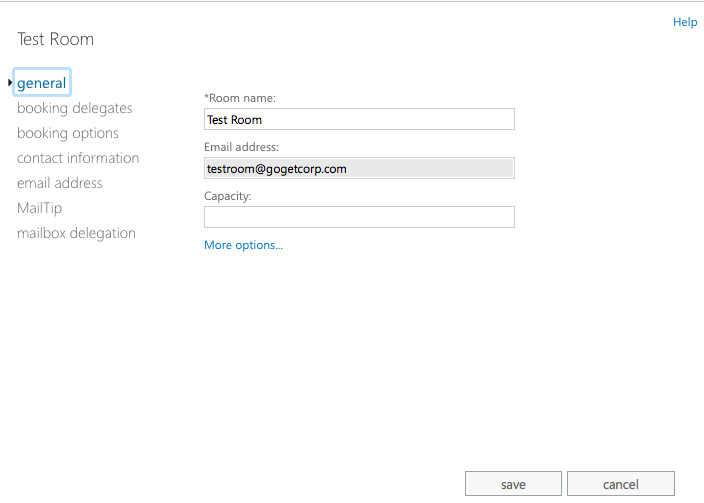 Add the account that has FullAccess permission to the room resource under “Service Account Username”. Note! The Service Account needs to have its own mailbox. Verify your identity then click “Perform Test”. If your configuration is OK you will see a “Connectivity Test Successful” message. If there is an error, find the code under “Test Steps”->”Additional Details” and check the list in step 1. Fill in your Exchange account information. Note 1.”Service Account Username” can be either the domain\user format or the UPN (user@contoso.com) format. Note 2. “Target mailbox email address” and “Service Account User Name” can be identical. Make sure “Use Autodiscover to detect server settings” is selected. Press Ctrl+F in the browser window. 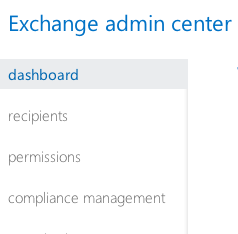 To give the service account full access you need to access powershell on the exchange server. 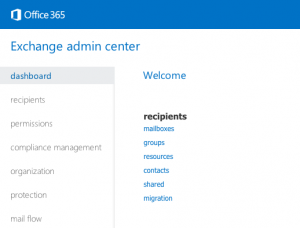 The command is the same for local and Office 365 however there is different ways of reaching it. 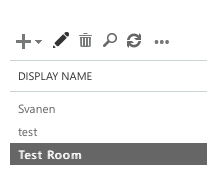 Per default on a room resource the title field is set to the same name as the organizer. You can change this behavior so that title is the actual title of the meeting instead of organizer. In Room Display 4/5/6 (on the device) press: “Press for Menu” -> “General Settings” -> “Room Display Center” . Thereafter set the switch to “on” under “Local Exchange Password”, add your Exchange password and thereafter press “Restart”. The software is now restarted with the Exchange password stored locally on your device. Room Display can connect with both Google Calendars and room resources (only available in Google Apps for Business). Open Google Calendar and login with your Google Account. 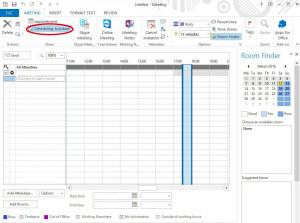 Create the calendar which the meeting room will use by following this guide. Make sure that the calendar is under “My Calendars” and that your permission is “Make changes AND manage sharing”. Connect your Gmail account by clicking “Google Calendars Setup” in Roomdisplaycenter. Login to Google Admin console with your admin account. Create a Room Resource for the Meeting Room by following this guide. Make sure that you add the resource to your My Calendars list. Connect your Google account by clicking “Google Calendars Setup” in Roomdisplaycenter. Create a new user by following this guide. Share the Room Resources with the new user by following this guide. Make sure that the new users have “Make changes AND manage sharing” permission. Login with the new user and check that the resource is in My Calendars list. 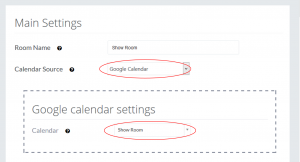 Connect the new Google account by clicking “Google Calendars Setup” in Roomdisplaycenter. Connect Room Display Center with Google Calendar by clicking “Room Display – > Google Calendars Setup”. Follow step 1-3 in the guide to connect your Google Account. Thereafter click “Press here for the next step”. Once the connection is finished you will see a status message with OK. Note! If you use room resources as calendars remember to select appropriate permissions in Google G Suite for the Google Account you are connecting. Click “My Units” and press the cogwheel symbol for the device you wish to configure. Under “Calendar Source” select “Google Calendar”. Select the Google Calendar that the Meeting Room uses. 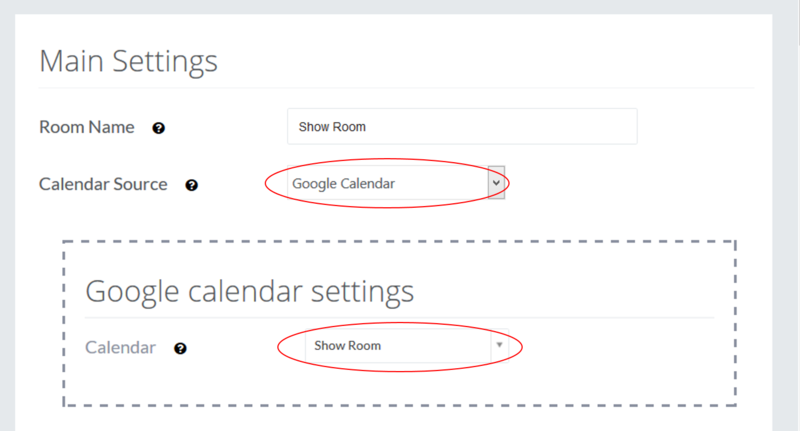 Continue the guide to configure how Room Display shows your calendar information. If you need further information, press the question mark symbol next to each option. When you are finished press “Save”. If you experience problems during the setup, see the points below or check out the rest of our FAQ. Verify that the Google Account that is connected to Room Display Center has correct access permissions to the Google Calender that is selected. Make sure to click on the text “Click here” in step two before you click the “Continue to the next step” button. To purchase support vouchers, please go to our Buy online page. Note! You can only have one support license key per Room Display Center account. If you have a support key, you can find it under “My account” by clicking the cogwheel in the upper right corner. Please submit your inquiry on the Contact page. If your organization has a firewall which limits traffic to the Internet, you need to configure it to allow connectivity with different services in order for your Android device to integrate with calendar services, send debug error reports and verify the product license. 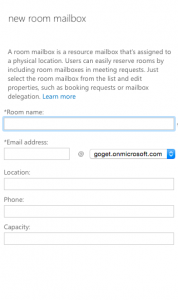 Can I make room reservations in Outlook? Yes. In fact, Room Display integrates seamlessly with Outlook. You don’t have to install anything – no plug-ins, no add-ins and no server software. 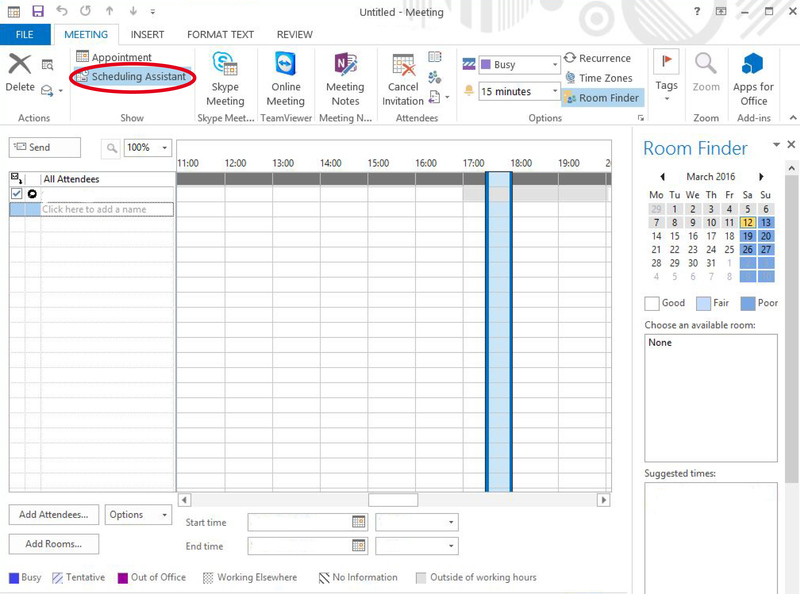 Just click Outlook’s built-in “Room” button when you want to choose and add an available meeting room to your meeting invite. Read more about Room Calendar Basics. Where can I find help about Room Display 3? You can find all information you need on our Support Wiki! When you buy a GoGet product that uses GoGet licensed software and related services, such licenses are valid for a 3-year limited time period. It means that the license expires after 3 years and that the user can choose to buy a new product license. The license cost is a one-time cost for a 3-year period, and is not a subscription – hence no obligations to continue using the service after 3 years. After 3 years, the user can choose to buy a new software license. The price and type of product will be based on GoGet’s offer at the time of the new purchase. GoGet does not offer perpetual licenses. 3 years is a long defined time period. Since comparable alternative products either have a very high initial investment cost, annual charges and additional service fees – Goget’s solutions are up to 60% more cost effective. No – there are no additional maintenance or service fees. No additional server software or plugins for eg Outlook are needed. Upon request, GoGet can perform a remote/manual license reset in the license database which is subject to a database fee of 95 USD per occasion, regardless of number of Room Display 3 licenses. Where do I download Room Display 3? You can choose from two ways of downloading Room Display 3; Google Play or Manual Install. Can I test run the software on PC/Mac? Download the Bluestacks App player from here. Install the software on your PC/Mac. Add a Google account during the installation to enable Google Play. Search for “Room Display 3″, “Room Display 4″, “Room Display 5”, “Room Display 6” or “Goget Room Finder” in Google Play depending on which version you wish to run. Now you are ready to start using Room Display/Room Finder on your PC/Mac! When pressing Home on the Android Navigation bar you should return to the app and not the default launcher (desktop). If this is not true set Room Display as the Home app by pressing General Settings->General Device->Reset Default Launcher->Home and select “always”. If your organization has a firewall which limits traffic to the Internet, you need to configure it to allow connectivity with different services in order for your Android devices to receive updated settings versions from Room Display Center and send mails from the device. Note: Use this feature with caution, all changes are irrevocable. My updated settings are not pushed out to the unit, why? If your organization have a firewall which restricts traffic to or from the Internet, you need to configure it to allow connectivity with Pyshy.me in order for your Android devices to receive updated settings versions from Room Display Center. Pushy uses MQQT as service protocol and for this you need to enable communication through ports 80, 443 and 1883 to host pushy.me. We always strive to keep Room Display/Room Finder updated with bug fixes and new features. To make sure you have the latest version you need to follow some simple steps depending on what installation method you originally used. There are two ways in Room Display/Room Finder to unregister a license key so that it can be reused on another device. Your unit is now unregistered and another device can be registered to the license. Room Display/Room Finder can be run in full Kiosk Mode which prevents users from exiting the application. In Room Display Center make sure you have “Start at Boot/Update” and “Autostart on Screen Off Enabled” enabled. Now Kiosk Mode is activated and there is a screen lock which prevents all interaction with Android OS until Kiosk Mode has been disabled. Activate the settings by pressing “Restart Unit Now” which will restart your device in Kiosk Mode. Disable Kiosk Mode by following the above steps making sure to switching the settings back to “on” followed by restarting the unit. When you have disabled SystemUI on a rooted unit (or as it is default on Room Sync) you have no standard way of accessing Android Settings. Through Room Display settings you can however access these to setup these settings. Only use the Back/Next buttons at the bottom to return. Exiting the settings window will lock the device and the only way to return is by powering off/on the device! Since Android 4.2 Google introduced secure ADB meaning that you need to allow a unit to debug android. This popup requires that you have System UI running (aka menus). If this is not enabled (e.g. Kiosk Mode) then you will not be able to grant a computer debug access. So this means that if your really unlucky you might have “bricked” your device this way. No worries however because there are ways to get back. They require that you clear user settings from recovery mode and then restoring your unit. Follow these steps to get back on track! Your unit is now free again and we can now set it up again. If you just want your unit back this is enough. However if you have SuperSU you need to set it up again. Now you need to enable debug and authenticate your computer. It will now remove all old stuff and install Room Sync Setup. Tap “Press for Menu” then General Settings -> General Device. Scroll down to the section Android Settings and configure both options “Date/Time Settings” and “Localization Settings”. Press Back/Next for each option to navigate back to Room Display. Should the issue remain after correct configuration in Android OS the error is most likely linked to incorrect date/time settings in your Exchange server. Contact your local IT department for assistance in changing these settings. Unfortunately issues will sometimes occur. For resolving this we have a built-in Debugging Tool which writes a log file that our technical department (for clients with support agreements) can analyze to identify what is causing the issue. NOTE! Do not run the debug for more than 24 hours. After the issue is replicated there are two alternatives for sending the debug log file: Direct or Client. Direct will use built-in SMTP settings to send directly to GoGet Support for further analysis (if you are running a rooted unit or Room Sync you need to use this option). 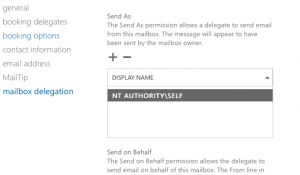 Client will open the default mail client for your device and attach the log to a mail message. If you see a message that the error log is empty, then Debugging has not been able to catch the problem. Repeat the debug process and try to send again. Where do I download Room Display 6? You can choose from two ways of downloading Room Display 6; Google Play or Manual Install. Search for “Meeting Room Display 6″. How do I renew/upgrade my license? Contact your reseller or info@gogetcorp.com to receive a quote for renewal and/or upgrade of your existing license. Pay for the renewal/upgrade voucher. Sign in to https://www.roomdisplaycenter.com with your account details. Click “License Voucher -> My Vouchers”. Click “Click to Renew” and follow the guide. Note! Check extra carefully which licenses you select to be renewed/upgraded since this action cannot be undone! Click the left menu option “Units” and then select the product you renewed. 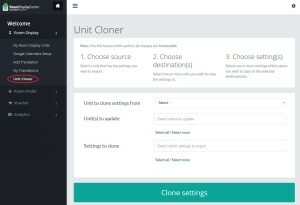 Click the cloud shaped button “Send settings to units” for each device, which will push the new license expire value to your device. Make sure the value for “Settings Version (Unit/Online):” are identical. If not, see this FAQ. Uninstall your current software on the device. Install the software you have upgraded to (eg. Room Display 6 license -> Room Display 6 software). Pair your device by logging in with your Room Display Center account. Can I use proxy with GoGet software? Proxy settings are set on your Android device – the exact location may differ depending on your Android version – but is generally found in the “More” section under the “Network” settings. Please note that while GoGet applications follow the system-wide proxy settings, the configuration of your proxy server may affect the application functionality if traffic forwarding is not set up correctly. Orange warning triangle is shown when settings versions are not synced. This warning is not critical, it only tells you that the settings of your unit, does not match the settings you have for the unit in Room Display Center. Consequently, the unit may not behave as expected. Unmatched settings versions might be caused by your organizations firewall restricting necessary communication ports. I cannot see any meeting rooms on the display? Login to https://www.roomdisplaycenter.com with your account. Click the cogwheel symbol in the top right corner. Enable the “Allow Remote Support” switch. Contact our sales team for documentation, trials and other information regarding Room Display Center central admin On-Prem. Where do I download Room Finder? You can choose from two ways of downloading Room Finder; Google Play or Manual Install. 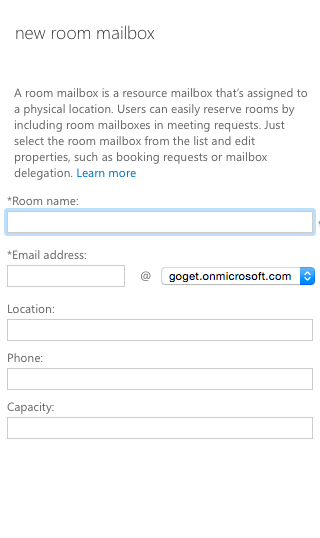 Search for “Goget Room Finder”. Press download and thereafter install. Direction arrows – how do I change? You can change direction arrows for each respective room, directly on the screen. Make sure your room resource calendars are configured correctly. Start Room Finder on your device. Arrow settings will be stored as long as you do not unpair device (display or media box) and Room Display Center. For Room Finder, GoGet recommends a Quad Core Android media player (box) with Android OS 4.0-4.4 and min 1GB DDR3. To setup the system, we recommend that you connect a wireless keyboard and mouse to the USB ports of the unit.